Rumours on the grape vine suggest that AMD will struggle to match the speed of the GeForce GTX 1080 Ti when its brand-new Vega architecture comes to bear in a couple of months' time. This is why, when we were out in Taiwan for Computex, most Nvidia add-in board (AIB) partners didn't seem unduly perturbed by AMD's imminent arrival. Of course, rumours are just that, so wait to see if there is actual meat on this rumour's bones. What's clear is that, admittedly expensive, the GeForce GTX 1080 Ti will remain very much a premium choice for the remainder of 2017. We have looked at plenty of said cards in the preceding few months, and today's offering is likely to be the last for a while. Let's make a good 'un, right? What you see is the EVGA GeForce GTX 1080 Ti FTW3 - quite literally the bigger brother of the SC2 Gaming that waltzed through the labs recently. This here beastie keeps to a two-slot form factor but does so at the expense of extra card height and width, now measuring 299mm long and 143mm high, compared with 269mm and 118mm	for the 'lesser' card. Though looking ostensibly the same design from a visual standpoint, the main reason for this enlarged space rests with the two-fold decision to use a fully-custom PCB and, for the first time, a three-fan cooler. Construction is first-class; EVGA goes for a thick aluminium cowling that's firmly screwed into the PCB. There's an additional three power phases for the GPU and letting the card breathe, the TDP has been increased from a reference 250W to 280W. The huge cooler has multiple types of fins - straight, pin, and L-shaped - that maximise airflow, as well as much more densely-packed fins closer to the centre. Five heatpipes snake through the design and curve around on the left-hand side. The FTW3 uses EVGA's nascent ICX technology which adds a further nine sensors on top of the baked-in GPU sensor. 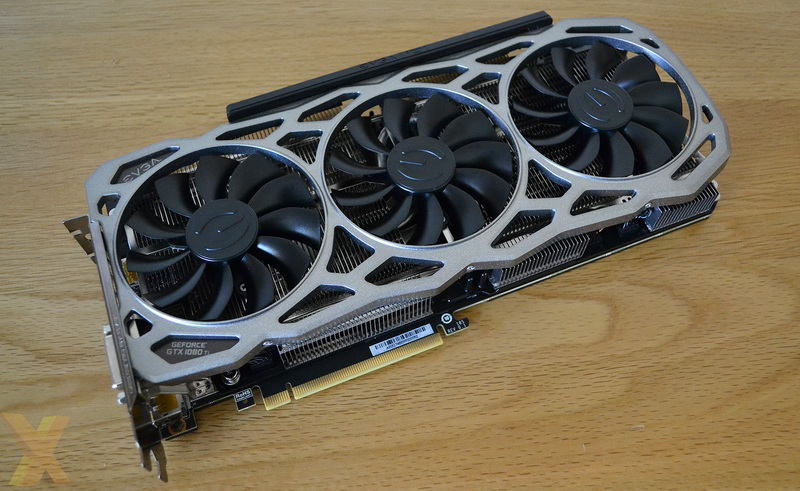 The premise is to be able to monitor and cool different parts of the card effectively, and the three fans can spin at different speeds depending upon how hot the GPU, memory or VRMs get. Interestingly, due to the their different designs, the locations of sensors differs between the SC2 Gaming and FTW3 designs. Heightened power limits means that EVGA adds in two eight-pin connectors, catering for those that want to push higher on the voltage. 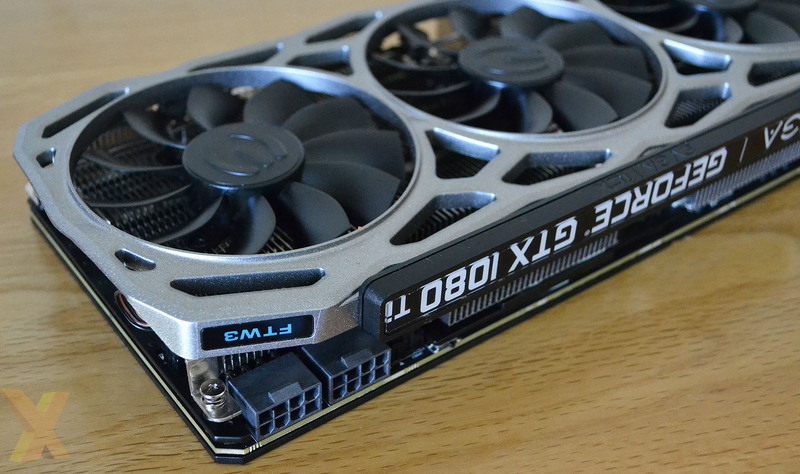 You'll know that the entire GeForce logo lights up nicely when the card is operational, though the iCX technology adds a further three LEDs that denote the temperature status of GPU, memory and VRMs. Of course, this being a 2017 card, the card's lighting is fully RGB. There's a full-width plate between the PCB and heatsink on the top side, and that's also the case on the back. A larger PCB means there is more dissipation area all around. 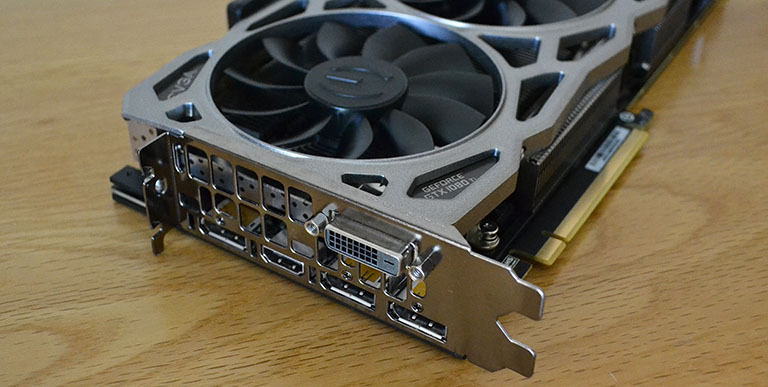 As usual, a couple of SLI fingers enable multi-GPU running if your wallet is deep enough. 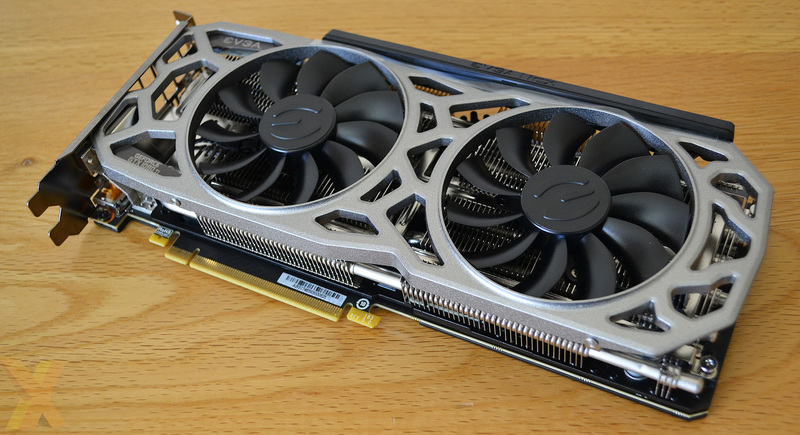 A side-on shot shows the true scale of the card and robust cooling. What is more difficult to see is a tiny switch that flits between the two BIOSes on this card - SC Gaming only has one. The point is to enable enthusiasts to tinker with the main BIOS whilst having a fallback just in case matters go awry. As it stands out of the box, the second BIOS, known as Slave, does away with the zero-RPM fan mode when the GPU is idling and has a more aggressive fan-speed profile in general. It is reasonable to expect a fully-custom card with an oversized PCB to offer higher frequencies than a standard card. However, this card is only very marginally faster than the SC2 Gaming in terms of pure specification, offering only 13MHz more base/boost speed, at 1,569/1,683MHz core. Memory speed is kept at a standard 11Gbps. The hope is that in-game performance is higher due to the enhanced TDP and robust cooling. We'll find out if that's true in the benchmark section. 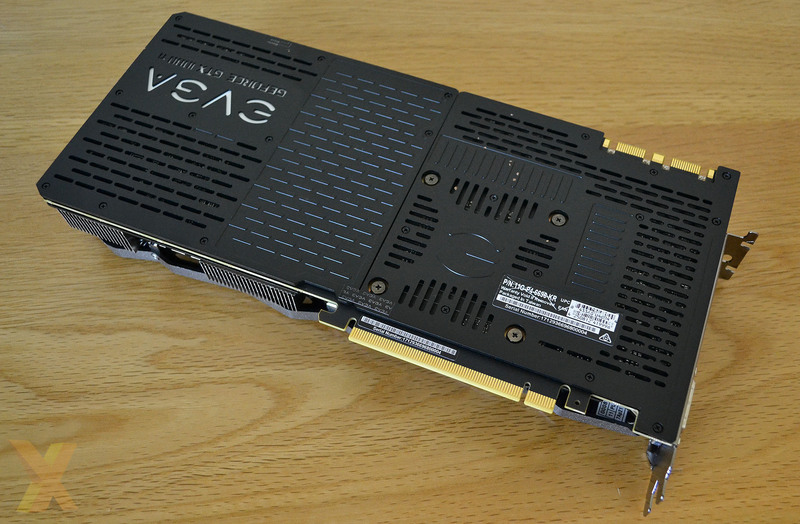 Where EVGA hasn't meddled is the outputs, comprising of a dual-link DVI, a trio of DisplayPort and a single HDMI. This premium card attracts premium pricing. At £780, it's right up there with the Asus Strix and, worryingly, significantly more than the MSI Gaming X. Let's now see if it warrants this premium.